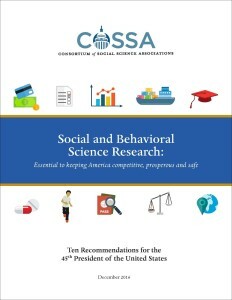 Before the holiday break, COSSA transmitted a report to the Trump transition team, Social and Behavioral Science Research: Ten Recommendations for the 45th President of the United States. The report outlines a number of steps the next Administration can take to support the U.S. research enterprise and use social science research in support of evidence-based policy making. This document can also be helpful in outreach to policy makers in Congress as well. The document is available on the COSSA website at https://www.cossa.org/press-publications/2017-transition-recommendations/.